As you might have read yesterday, I am having a PET scan on Monday. The hope is, we will either find a carcinoid tumor, or something along those lines that is responsible for some of the symptoms that have been plaguing me for the past few years. And if not, we will move on to other possibilities, instead of wondering forever if I might have more neuroendocrine tumors. I don't know what to hope for anymore. I've spoken about this before, hoping that something is found, no matter what that something may be. It's a target to focus on, a challenge to conquer, instead of a mystery. 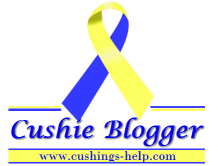 Before I was diagnosed with Cushing's, I used to hope for a diagnosis, ANY diagnosis, that would solve the mystery, regardless of what came next. I have that same feeling, but this time, with a sense of dread. I dread the results of this scan. I am so scared of them finding nothing. Being at another dead end. I'm also scared of the possibility of another tumor. The surgery or treatment to follow. I don't really know what to expect. I do know that whatever is found, even if it's nothing, I've conquered worse. I've been through worse.